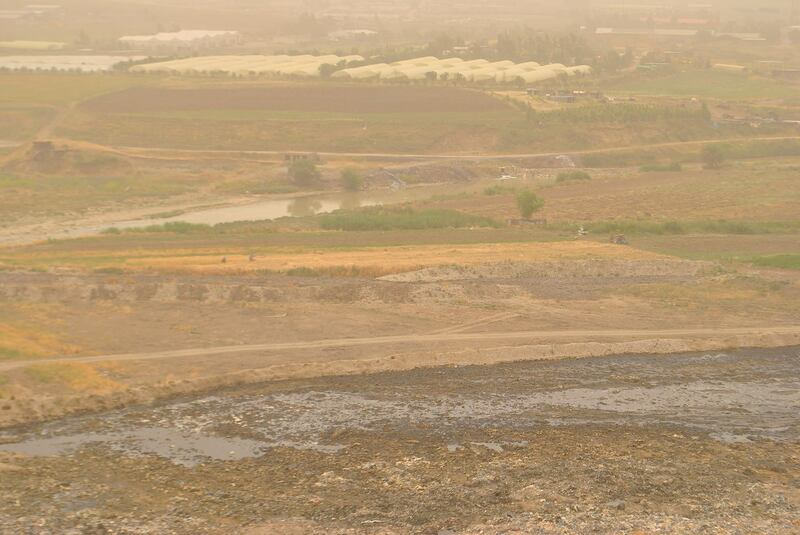 Neglect and toxic waste made the uncontrolled dumpsite in Sulaymaniyah a ticking bomb. Yet, authorities have proved to be unwilling or unable to defuse it, casting a bleak shadow on the affected population. For decades the municipal and industrial solid waste of Sulaymaniyah have been dumped in a disposal site of few hectares looking out onto the banks of the Tanjaro River in the southern part of the city. Poor management and lack of waste treatment have resulted in the severe contamination of soil, water, and air of the surrounding area. Besides urban waste, oil refineries and cement plants nearby unload production residues into the city dump. Around 75% of medical waste from local hospitals is also disposed in the same place. 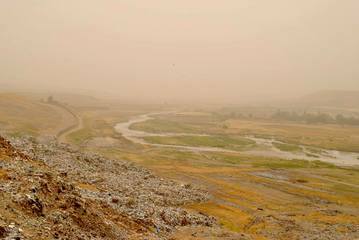 Soil and water samples taken in proximity of the landfill showed concentrations of Iron (Fe), Manganese (Mn), Cadmium (Cd), Nickel (Ni), Cobalt (Co) and Chromium (Cr) above permissible levels. The exposure to heavy metals and hazardous compounds undoubtedly affects health and livelihoods of the residents of the poor industrial suburbs and rural villages around the site, who suffer a disproportioned impact also due to inadequate sanitation and no access to improved water sources. They reported fatigue, headache, dizziness, diarrhoea, bronchitis, shortness of breath, kidney problems, skin diseases, and cancer cases as health problems that are directly and increasingly related to the dump. Although fully aware and concerned that the groundwater on which they rely for domestic and agricultural uses is polluted, residents say they are unable to leave or adopt measures to reduce health risks because of economic deprivation. Farmers keep on cultivating unproductive farmland given that there are no alternatives in sight. 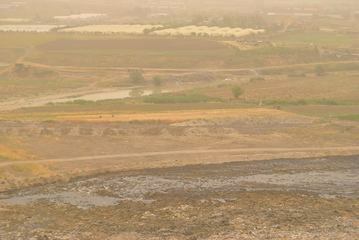 The leachate visibly seeping out the landfill into adjacent fields and then entering the Tanjaro River, which flows all the way to Darbandikhan Lake and from then on is a tributary of the Tigris River, exacerbated the situation by poisoning waterways and the food chain of downstream communities. In June 2016, Waterkeepers Iraq tracked that a massive oil spill had travelled over 140 metres down the hillside towards the Tanjaro in about 4 months (on average 1.3 metres per day); the spill eventually overflew the soil embankment separating fields from the landfill and reached the river by August of that year. Since then, no significant action has been taken by competent authorities for the implementation of standard procedures of waste disposal and to reduce contact with pollutants. The financial crisis of the Kurdistan Regional Government should be taken into account, but it is not a sufficient factor to explain the lack of public intervention. As elsewhere in the region, the general lack of policies and guidelines is coupled with the limited enforcement of the existing legislation. Regulatory and monitoring bodies were found to be either inoperative or ineffective. Furthermore, the association of many polluting companies to influential political leaders has prevented so far both an institutional response and a collective mobilisation. In the latter sense, fear of repercussions was indeed a recurrent theme coming out of field visits as residents were asked about the possibility of organising protests. This notwithstanding, local environmental NGOs such as Waterkeepers Iraq and Nature Iraq have monitored the situation and called government levels to comply with minimum requirements of environmental protection. 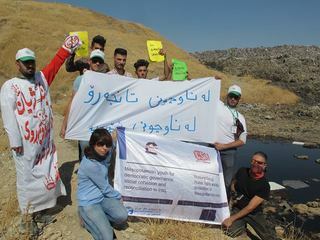 On 15th October 2017, activists from various civil society organisations in Sulaymaniyah and Darbandikhan (members of the ICSSI’s ‘Mesopotamian Youth’ Working Group on Water Rights) staged a two-day demonstration to bring the issue to the attention of the Provincial Council of Sulaymaniyah. Already serious, the situation is doomed to become catastrophic if not addressed promptly. 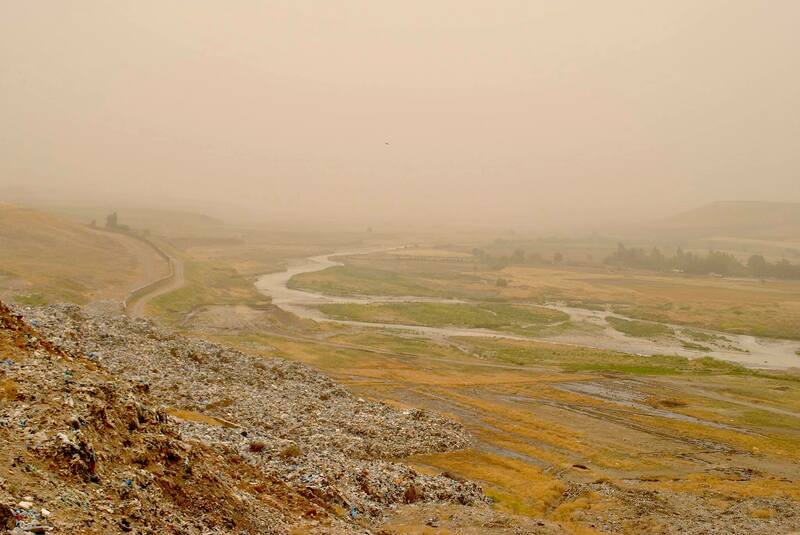 Project Details It is an uncontrolled and not fenced solid waste landfill, located 1 kilometre south-east of the city of Sulaymaniyah. Waste is dumped into piles without treatment and is only partially covered with earth. 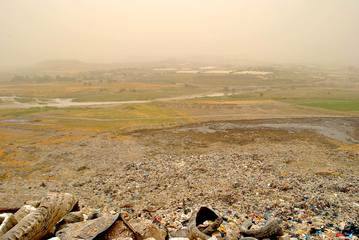 Lines of rubbish trucks unload on the top of the hillside between 1,200-1,400 tons of garbage daily. For the most part (estimated 60%) it is organic, though mixed with materials of all kinds. 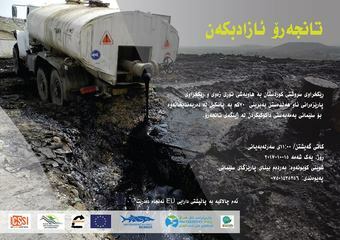 The Municipality of Sulaymaniyah and four private companies are in charge of collecting and disposing waste, but no consistent procedures of sorting and disposal are observed. Once unloaded, the piles of garbage are pushed down the steep hillside overlooking a cultivated valley and the Tanjaro River. The site is acrid-smelling and full of dangerous sharp metal sheets or other potentially dangerous materials, but waste collectors work without basic equipment such as gloves and masks. Around 50-75 scavengers access the dump every day in search for plastics, aluminium or other metals to either recycle or sell them. Cases of injuries and deaths due to accidents with rubbish trucks and bulldozers were reported, not to mention the high likelihood of getting infections or diseases. 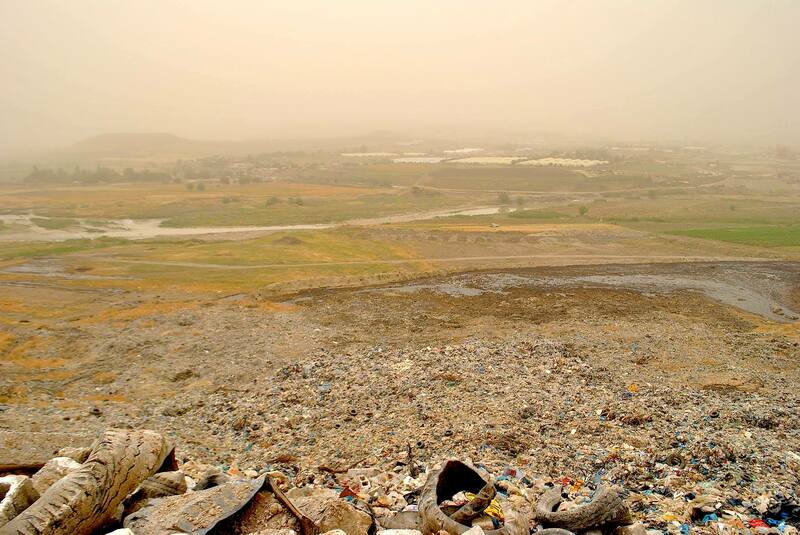 The dumpsite borders the industrial area at the outskirts of Sulaymaniyah and all nearby factories deposit waste and production residues in there. Development of Alternatives Proposals put forward by activists and researchers encompass the conversion of the open dump into a sanitary landfill or its outright closure, identify a new landfill area, monitor pollution levels, segregate hazardous waste materials, implement leachate treatment, establish waste recycling plants, provide compensation to local communities, and undertake epidemiological studies. Why? Explain briefly. To date regional and local authorities have not taken any action to tackle the toxic pollution caused by untreated waste. 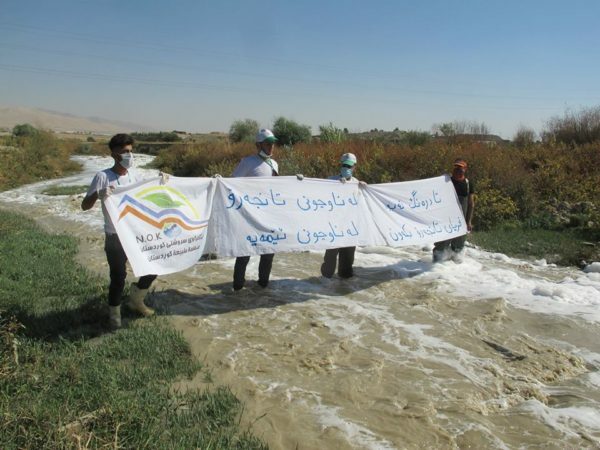 Aziz, Nigar A., Sabah M. Salih, and Nizar Y. Hama-Salh (2012) Pollution of Tanjero River by Some Heavy Metals Generated from Sewage Wastewater and Industrial Wastewater in Sulaimani District. Kirkuk University Journal for Scientific Studies, 7(1), 67-84. Tinti, Alessandro (2017) Water Resources Management in the Kurdistan Region of Iraq. IRIS Policy Report.